Blue Suede News #58, Paladins, Dave Gonzales, Starlight Drifters, Chris Casello, Matt Hole, Agriculture Club, Kearney Barton, Rockabilly, REAL Country Music, '50s Rock'n'Roll! 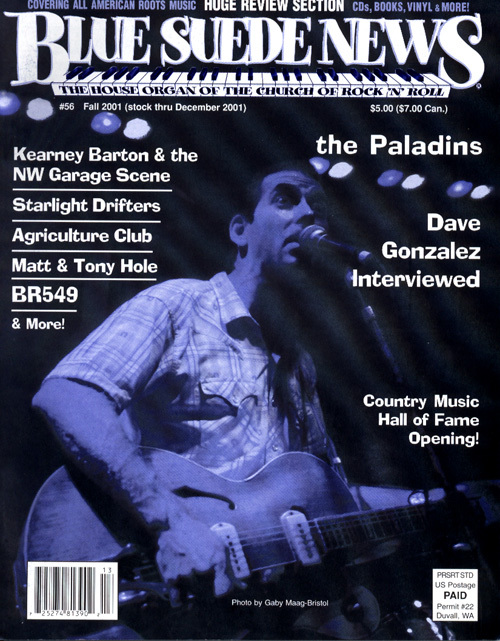 Blue Suede News #56 features a lengthy and interesting interview with Dave Gonzales, charismatic front man and guitarist of the Paladins. The Paladins are a hard working Roots Rock / Blues and Rockabilly trio with a big following all over the world. Another big feature is an interview with Country roots rockers BR549. Their songs reached the Country charts. Great band and lots of background information in this interview. There is an extensive interview with another band just as good as BR549, a Rockabilly, Honky Tonk and Western Swing group called The Starlight Drifters. Front man Chris Casello is an amazing guitar player! Austin Punk Rocker Matt Hole is featured with a story about his brand of modern Rockabilly / Psychobilly and alt. Country Punk rockers Agriculture Club with a feature called Smell The Dairy Air. One of the highlights of this issue is an extensive interview with Northwest recording pioneer, label owner and producer Kearney Barton. He recorded the Kingsmen, The Ventures, The Frantics and other garage rock artists and is still active today. There is also an article about the Grand Opening of the Country Music Hall of Fame in Nashville, Tennessee. Send $7.00 (U.S. or Canada), or $10.00 (Outside the U.S. and Canada) and note which issue you're buying - to Blue Suede News, Box 25, Duvall, WA 98019-0025 U.S.A.